The first half of our domestic programme concluded with the First Points Competition on Wednesday evening (12 Dec). Nine members contested for the medal and the opportunity to test their skills against the current ice. 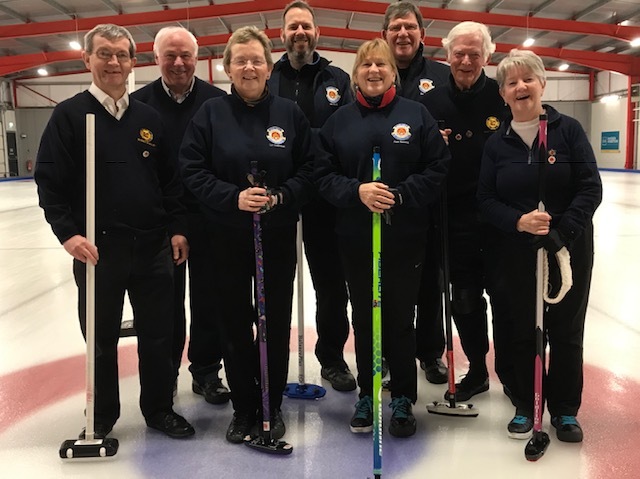 In starting order of play the participants were Dave Anderson, John Jacobs, Ronnie Hope, Jim Cowper, Jim Ramsay, Craig Brown, Ken Hunter, Alex Moir, and Keith Morris. The ice was somewhat challenging, but that may just be because it was different to our past experience. At the close of play Keith Morris emerged as the winner on 33 points, with Ken Hunter in second place (30 pts), and Jim Ramsay in third place (29 pts). Congratulations to Keith on his win. It was an enjoyable evening, and it was good to have the opportunity to try Points on the new ice pad as we will face our “old enemy” Merchiston in a Team Points Match in January. Points is a great way to learn and to gain more experience about how to play the ice we have. The Second Points Competition is on Tuesday 19 February, and the Intermediate Points Competition is on Wednesday 27 February. This entry was posted in Club, Competition on December 13, 2018 by captainken45. Eight members had an enjoyable evening battling to win the High Road or even the Low Road. In the preliminary skirmishes, Anderson, Brown, Ramsay, and Hunter overcame their respective opponents to go forward to the High Road. In the Low Road semi-finals, Lambie beat Hope, and Moir beat Jacobs; so Andrew met Alex in the final. Alex had played very well in the earlier rounds but Andrew’s experience kept him in the lead in this last game. Congratulations to Andrew on winning the Low Road. In the High Road semi-finals, Brown beat Anderson, and Hunter beat Ramsay; so Craig met Ken in the final. Craig took a single in the first end (of six) and Ken countered with a three in the second end. Craig took another single in the third end, and Ken replied with a single in the fourth. Neither player particularly shone in the fifth end, but Craig manged a single with the final shot of the end. In the final end two silent strikes from Ken with his last two stones left Craig with a two to take the medal 5-4. Congratulations to Craig on his win, he played well throughout the competition. Finally, special thanks to Jim Ramsay for coming in at the very last minute to ensure that we had a full entry on the night. This entry was posted in Club, Competition on December 10, 2018 by captainken45. Team Ramsay (flying under the Dunbar flag) met Team Scott in the final of this season’s competition. Team Ramsay got off to a good start with a two then a steal of four. In the third end, Roger Scott moved two opposition counters from the centre of the house to the back of the four foot and Iain was subsequently able to get a draw in to them to take a single. Team Scott remained up against it with Jim’s team rarely putting a foot wrong. In the sixth end, Iain Scott managed to convert a position of 3-down to one of 3-up with his last stone to make it 10-4 to Team Ramsay and conceded the game. Congratulations to the winning team, Jim Ramsay, Robert Beaton, Martin Hobbs, and Les Dalgleish. Commiserations to Iain Scott and his team of Roger Scott, Pam Ramsay and Vic Ramage. This entry was posted in Club, Competition on December 4, 2018 by captainken45.